Often neglected and forgotten, our front door could always do with some tender loving care. Spruce up the entrance to your home and give visitors a real treat when they come knocking. 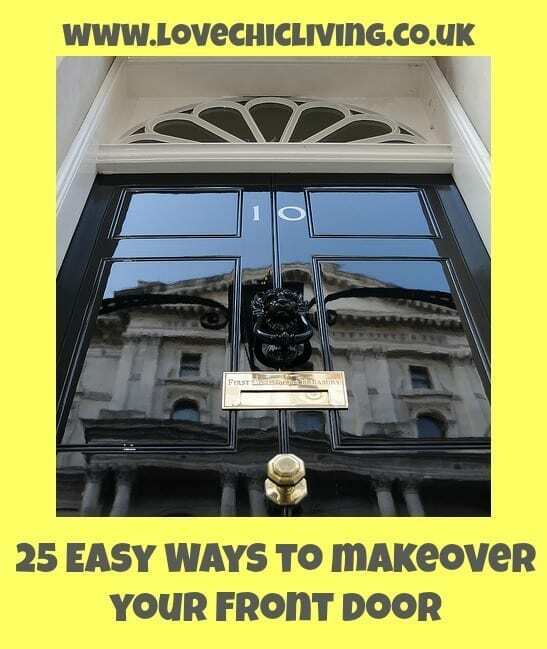 A little while ago I wrote about updating the general entrance to your home but here are 25 easy ways you can add some flair to front doors everywhere. 1. Give it some love and let your front door know you care. Remember to brush and wash it down and polish any door furniture regularly. 2. When it’s ready choose a fresh new paint colour. Go for something bright and bold to really give it a wow factor. 3. Give your front door a very contemporary look with sticker door numbers. Big and bold they look like they’ve been etched on. 4. Create a unique house name by taking the first letters from each of your name plus some from your surname. What do you come up with? 5. Add a quirky welcome in the shape a topical outdoor sticker. ‘Hello’ ‘Merry Christmas’ or ‘Please come in’ all add a bit of fun. 6. Change the glass if budget allows. Go for something etched or patterned to ring the changes. 7. If budget doesn’t allow for new glass look out for patterned DIY vinyl stickers or etching spray. Use stencils and spray to create your own unique look. 8. Don’t be afraid to be bold, match the colour of your front door to groups of plant pots to add impact. 9. Doorbells can be fun and as well as practical, invest a new one and record your own personal welcome message! 10. Door furniture makes a huge statement and keep it simple for a contemporary look. Add one huge door knob and leave it at that. 11. Update your mailbox and get yourself a US style outdoor one. A great addition to a modern entrance. 12. You door knocker says a lot about you! Make it personal and really find one that suits your personality and style. Hunt antique shops and auction sites for the perfect fit. 13. Use stripes! Go really bold and make your front door that one that stands out by painting on some stripes for a real statement. 14. Don’t forget the doormat. Again it’s a great way to personalise your front door and there are some great styles and designs out there. Hunt out your favourite. 15. Light the way with lots of solar lights leading right up the doorway. A lovely way to come home in the evening. 16. Install a new sensor and electric light for the winter. Maybe go for something nautical or industrial to keep it modern. 17. Add symmetry with a planter and box tree each side of the doorway. The eye loves symmetry and this is a great way to add a new dimension to the front door. 18. Hanging baskets are pretty and smell wonderful in the summer months, just remember to keep watering and pruning so they look their best. 19. Fresh flowers and plants at the doorway look so inviting and show you care. 20. Welcome visitors with scented herbs in the spring and summer. Plant your favourite like thyme, rosemary and mint in tall pots so the scent is released as they brush by. 21. Think about using colour in interesting ways. Colour block your front door with the step or paving, and with planters. Keep it modern and minimalist for a contemporary look. 22. Use more than one colour on the front door to add real interest. Split in half and paint one colour on the top and another on the bottom or keep to a main colour and add contrast on the edges or around window panes. 23. How about a seasonal wreath? Make your own or check out places like Pinterest for inspiration. I have a lovely Christmas wreath Pinterest board that could prove useful. 24. If you have a porch keep it in tip top shape and declutter regularly. No-one wants to be greeted by smelly, dirty shoes everytime they come to visit. 25. Finally, let your imagination run free and put your own stamp on your front door. Don’t worry what the neighbours have done, create the entrance to your home that you want and make it your own. Some excellent tips I feel inspired to get some box tree and a new bell! Pingback: Add Value to your Property! Great tips, thanks for sharing. The front door is like the face of the house. By the first look of the front door, you shape upop your opinion about the household and the family that lives there. Taking care of your front door is definitely a must.